Today dawned dark and dreary in my corner of New England. I woke to a dusting of snow, gray skies, and ongoing drizzle forecast for the remainder of the day. It's days like these when you turn to a one-pan, comfort food dinner like this recipe for Forgotten Pork Chops. This recipe is perfect for a dreary winter weeknight or any day you want an easy, hearty meal. Truth be told, this recipe came about on a day when I wasn't really in the mood to spend time in the kitchen. Much like today, it was dreary. It was pouring rain and we had just sent the last of our guests home from my son's wedding. All I wanted to do was sit with my feet up. 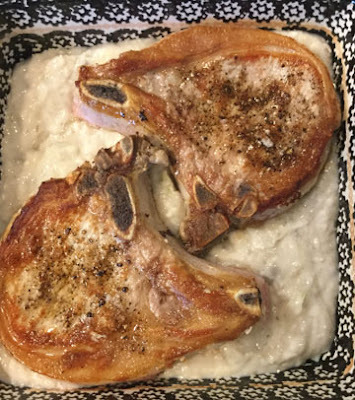 I needed an easy pork chop recipe! This recipe is the result and has been a favorite ever since. The recipe serves two to four, depending on the number of pork chops you use. 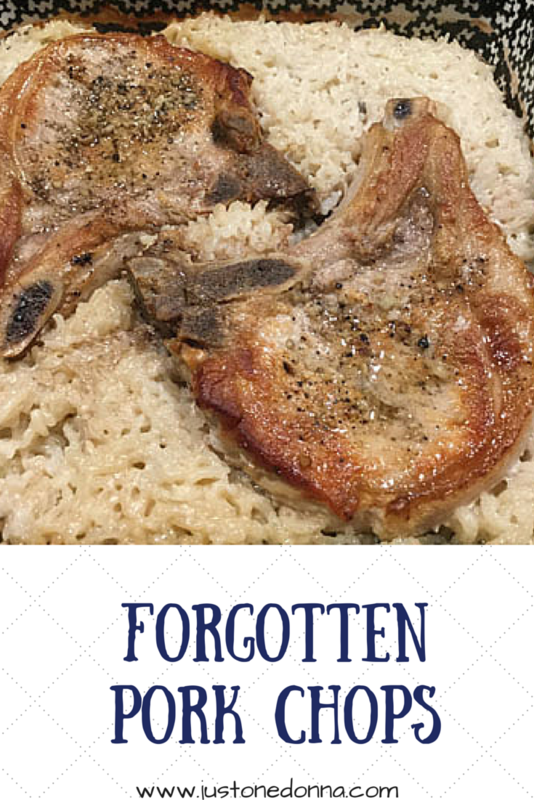 This Forgotten Pork Chops recipe couldn't be easier. Canned cream of mushroom soup is key to the flavor. No snarky comments, please. You know you already have some in your pantry just for recipes like this. This dish is perfect for days like today when you know you want a hearty meal, but don't really feel like cooking. All of the ingredients are combined together in one baking dish and then baked together in the oven. It's easy as can be! Preheat the oven to 350 degrees F. Heat the olive oil in a large skillet over medium-high heat on your stove top. Season the chops with salt and pepper. Brown the pork chops for 3-5 minutes on each side or until you get a nice brown sear. Set aside. Spoon the mushroom soup into a two-cup glass measuring cup, Add water to make two cups liquid. Mix the water and soup together. Add the chopped onion and mix to combine. Add one cup of rice to the soup mixture and stir to combine. Pour the soup and rice mixture into a 9" square baking dish (13x9" baking dish when baking four pork chops). Place the chops on top of the rice mixture. Cover the baking dish very tightly with aluminum foil. You want to be sure you keep as much steam as possible in the pan as it cooks. 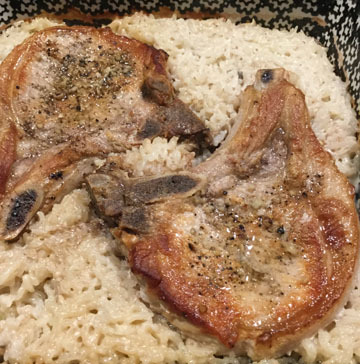 Bake the pork chops and rice for 90 minutes. Remove the pan from the oven and check to be sure the rice has absorbed the liquid and is ready. Be careful when you remove the foil. The steam will be hot and can burn you. Serve with your favorite vegetable side dish for a complete meal. Try these other pork chops recipes, too. For one of my favorite pork chop dinners try Pork Chops with Onions and Provolone Cheese. For a yummy baked pork chop and stuffing main dish try Gloria's Pork Chops. For a delicious, slow cooker pork chops recipe try Slow Cooker Pork Chops with Seasonal Vegetables. 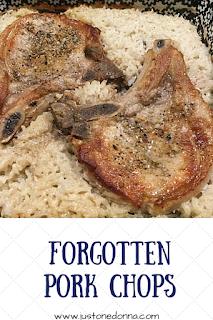 For a grilled pork chops recipe try Teriyaki Pork Chops with Coconut Rice. Please join me on my Facebook Page. I'd love to see you there!